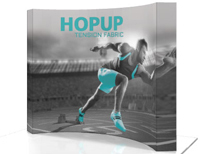 The Premium Hop Up Display continues to be one of the most popular trade show displays. The display sets up in less than five minutes, is lightweight and easy to transport. The frame on the Premium Hop Up display has a lifetime warranty and uses 1/2" think square tubing to support the tension fabric graphic. We also offer every Premium Hop Up in a kit that includes a shipping case, lights, and an optional case to counter conversion kit. Backlit Hop Ups are available table top, 10 foot, and 8 foot options. Every kit includes a full color graphic and back lighting kit! 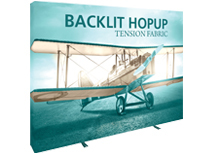 The backlit Hop Up is the newest addition to our line of Hop Up displays! Hop Up Dimension Kits can add onto any of our standard Hop Up systems. They offer a unique look and the ability to mount monitors! They also work with any 3rd gen Hop Up frame if you already have one! The 10 foot Premium Hop Up display is available in curved and straight models and we offer printing with or without end caps. The 10 foot model is also available in a complete kit that includes a case and lights! 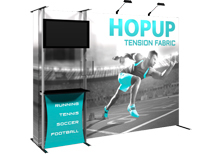 The 8 foot Premium Hop Up is available in curved and straight models and is ideal for booth spaces that are slightly smaller than 10 feet. You can also use the 8 foot model in a 10 foot booth to save space! 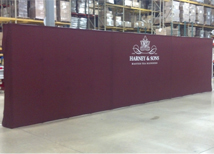 The 20 foot Premium Hop Up display uses a seamless fabric graphic to create a stunning backdrop. The frame consists of two 10 foot frames so its very easy to purchase a 10 foot graphic and use one of the frames! 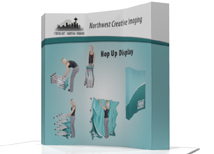 Table top Hop Up displays are great for smaller conventions and marketing events. The compact size makes it very easy to carry onto an airplane and transport to the convention hall. 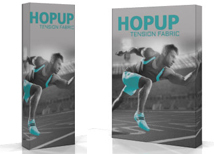 The Premium Hop Up display is available in many different sizes. 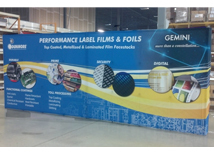 We carry all the sizes for exhibitors looking for a specific size display. Larger and smaller models can be made upon request! All of our Premium Hop Up displays are available in complete kits. These kits include the frame, graphic print, carrying bag, shipping case, lighting, and case to counter conversion kit. Oversized Hop Ups - 30 and 40 ft.
Our oversized Hop Up Kits include 30 and 40 foot wide sizes. Made up of multiple 10 foot frames and one large graphic, this system is portable and looks seamless when assembled! The Premium Hop Up display frame is manufactured by Orbus Company in Bolingbrook, IL. There is a lifetime warranty on the product because it is designed to last for a lifetime. The thick, high grade aluminum is designed for durability and is superior to the OneFabric display frame. The low price point and extremely high quality makes the Hop Up display a great value compared to many other display products. All of the Hop Up displays are also available in complete kits that include cases and lights. Our unique size section has Hop Ups that are available in non-traditional sizes. 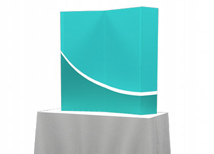 We also carry a full line of banner stands and back wall displays that can be combined with the Premium Hop Up display. 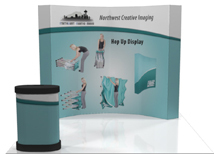 NWCI's low price points make it possible to add many items to your booth without depleting your budget. We test all of our products to insure they are quality, long lasting products. The Premium Hop Up display exceeds all of our requirements and is rated as one of the highest quality pop-up style displays available.